It’s my first Friday night in Atlanta and here I am sitting on my bed in my tiny apartment, blogging and watching Netflix. It has finally hit me that I’m in a strange city and I don’t have anyone to fall back on. I am so far out of my comfort zone but I didn’t move away from the familiar to realize that I am predictable and like to play it safe (I mostly don’t want to hear the I told ya so‘s later). It is easy to say now, in my comfy warm bed, that I am not going to let this fear of trying something new keep me from enjoying this amazing experience I have in front of me. 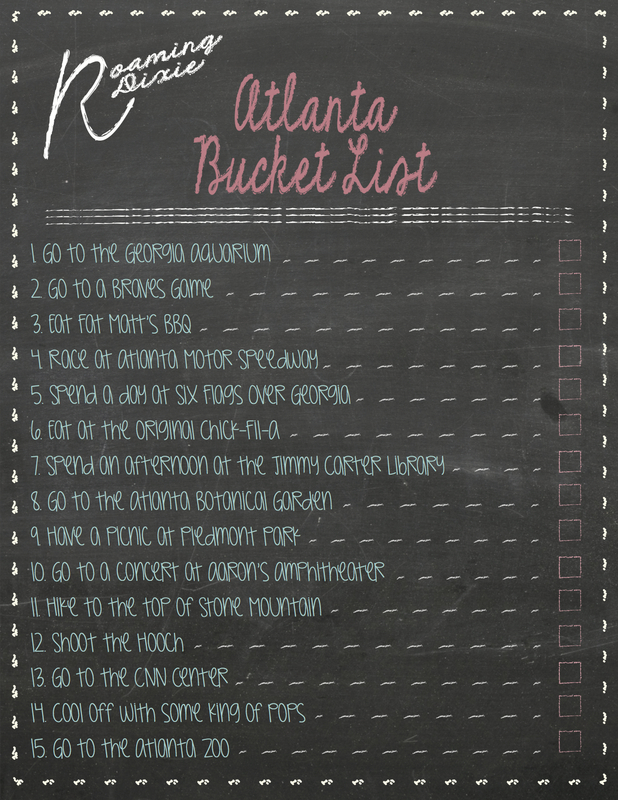 Thus, in true Roaming Dixie form, I created a list: my Atlanta Bucket List. 15 things I want to do before I head back to sunny South Carolina in August. Starting tomorrow. Enter your email address to get Roaming Dixie's posts straight to your inbox!